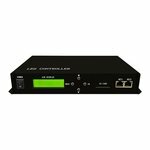 Slave controller that transmits data based on Ethernet protocol, can be connected to computer or master controller. Max. number of pixels: 8192. H805DMX decoder is designed to convert a signal of the universal DMX512/1990 standard into a signal for LED control. 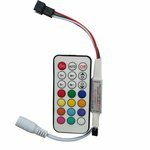 LED RGB controller with SD card, supports DMX 512 and various types of ICs. Control via Ethernet connection. 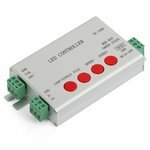 Online LED controller. 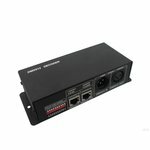 Compatible with DMX 512 protocol, WS2811, WS2801, UCS1903 and other ICs. 8 channels, 1024 pixels each. Supports SD cards up to 2 GB. Allows controlling and displaying text/images on LED RGB modules. Max. number of pixels:8192. 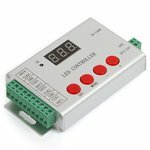 LED Controller with RF remote control for RGB LED strips (WS2801, WS2811, WS2812, WS2813). Voltage: 5-24 V.
Designed for controlling variety of single-line and double-line chips using Android app via WiFi connection. Max. number of pixels: 2048. Special controller which enables the LEDs to play different effects depending on the rhythm and strength of music. Max. number of pixels: 4096. 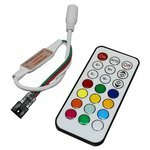 LED symphony controller with radio remote control for RGB LED strips (WS2811, WS2812, WS2813). 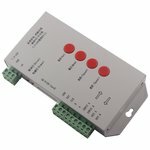 Voltage: 5-24 V.
Designed for controlling variety of ICs with one channel. IR remote control and a built-in segment display. Max. number of pixels: 4096. 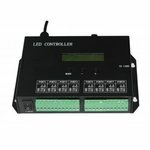 LED RGB controller with SD card, supports DMX 512, WS2811, WS2801, WS2812B and other ICs. Output current: 5 A × 3 channels. 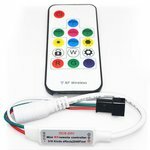 LED controller with Bluetooth control via Android/iOS smartphone for RGB LED strips (WS2801, WS2811, WS2812, WS2813). Voltage: 5-24 V.
Designed for controlling variety of ICs with 4 channels. IR remote control and a built-in segment display. Max. number of pixels: 6144. 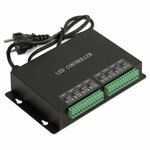 LED symphony controller with IR remote control for RGB LED strips (WS2811, WS2812, WS2813). Voltage: 5-24 V.
Designed for controlling 5050 LEDs with various IC chips via two channels with 1024 pixels each. Max. number of pixels: 2048. Designed for controlling variety of single-line and double-line ICs with one port. High-efficiency model, four operation modes. Max. number of pixels: 2048. 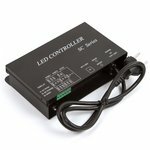 LED symphony controller with IR remote control for RGB LED strips (WS2811, WS2812). 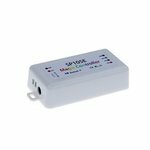 Voltage: 12 V.
LED Symphony Controller with RF remote control for RGB LED strips (WS2811, WS2812). 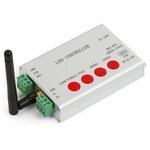 Voltage: 5 V.
LED Controller with RF remote control for RGB LED strips (WS2801, WS2811, WS2812, WS2813). 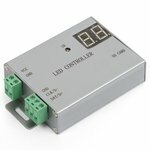 Voltage: 5 V.
LED Controller with RF remote control for RGB LED strips (WS2801, WS2811, WS2812, WS2813). Voltage: 12 V.